When you check in into these ‘better’ hotels you get a kind of key (nowadays mostly a plastic card) and a key carrier, the bellperson who guides you to your hotel room. Once you leave your room afterwards you are on your own and you need to find your way back to your room. Usually this is easy because all hotel rooms are numbered and not all hotels have blossomed into monster sleeping places with hundreds of rooms. However, if you happen to be in one of these 5 star monsters, you need to be extra careful. If the monster is a high-rise then there is no need to worry. I mention this because I happened to stay in Bali’s Westin Hotel where there are even and odd room numbers, same as in other hotels, but in Bali’s Westin the distribution is different: there is a wing for odd numbers, and one for even numbers. It’s a similar concept to wing A and B but for more sophisticated people, I guess. If you are not aware of that as you followed your bellboy and went straight to the bar afterwards, can you imagine the challenge? Half-drunk you return, have reached your floor and now you stand next to your hotel room, let’s say 3404, you get your key card out because 3405 will be the next room to give you access to your private loo (another even number) desperately needed by then. All you see is 3404 is being followed by 3406, you go further to see 3408, and the same even numbers such as 3414, 3416, …3434 are to be found on the other side of the floor. By then people hear you swearing out loud. You walk back, feeling the pain in your bladder to learn that next to 3404 is 3402…. Then you walk faster to try another floor, but same even numbers and not yours. Can you imagine the pain by now? 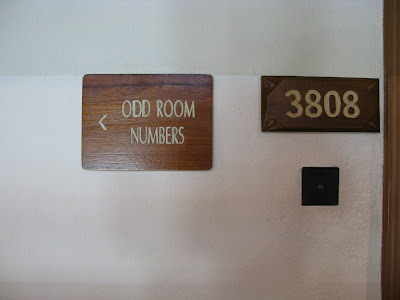 After a few more minutes you run to the reception, but shortly before you see a sign next to one of these even room numbers providing you with the direction to odd room numbers. You walk faster now, and by then you are terribly pissed by such a hotel. Welcome to Bali’s Westin Hotel, the pleasure is yours. Odd photo from Westin Hotel, Bali, August 2008.